As a special New Year’s gift, Sahaja has written an inspiring step-by-step guide to transfiguration. If you want to learn how to see beyond forms, click here. The Greek Cynic philosopher Diogenes used to carry a lantern in broad daylight, looking for an honest man. He did this not because he was weird or an odd character, but, essentially, because he was lonely. It was a subtle invitation to see in a different way–in the light of awareness, of beauty… Perhaps you, like many people, consider this season the most beautiful time of the year, a moment for celebration, gifts, and joy. But, look carefully. Nature has always had a secret language of celebration: the language of Beauty. Beauty exists at all times and everywhere. Through its lens, the world is revealed to be not an external, separate reality but a most precious gift. Each moment of beauty is a glimpse of awareness that represents a sacred invitation to recognition and celebration. The sense of beauty is in itself a Self-reflection. The refrain “beauty is in the eye of the beholder” doesn’t just refer to the subjectivity of perceptions. It means that the perception of beauty is a fully conscious act, which requires a proper organ of perception. This organ is an Open Heart. With this understanding, you no longer remain merely a passive observer of what you consider “beautiful,” but you start recreating the world, discovering its nirvanic nature. From the Heart, you project your inherent sense of beauty upon the world. In this way, you recognize the immanent Beauty of your being, a beauty that ultimately expresses itself through all of your actions. The perfect artistic creation should be so archetypal, so transparent and transpersonal, that it feels like an anonymous work of art, with the artist having become one with their creation. In the same way, the Creator of all these worlds seems anonymous and majestic. But, just because the Creator is anonymous doesn’t mean that it doesn’t exist… In the mystery of Beauty, the sacredness of matter (which seems to be an external condition) and the perfection of the soul (the inner condition) are revealed. It is both a primordial sensation and an inspiration freed from the rational mind. “When you and the object have become one, when you have plunged deep enough into the object to see something like a hidden light glimmering there, your poetry arises by itself,” said the great Zen master and artist Matsuo Basho. On December 15th, we welcomed 30 new Hridaya teachers into the family. After more than 600 hours of dedicated practice and instruction in the path of the Spiritual Heart, these beautiful souls are glowing inside and out. From the Hridaya Community, we send these fresh teachers blessings and love for the road ahead. If you feel the calling, apply now for the 2019 TTC! Applications close on the 30th of April and a waiting list is anticipated. Do you want to honor the authenticity and aliveness of your being in every moment? Then, join lovely Luna for the Compassionate Communication Workshop from January 25th-27th. 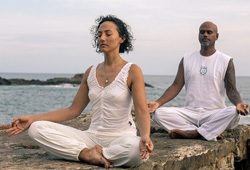 Through the practice of Non-Violent Communication and Self-Enquiry, you’ll learn how to cultivate heart-to-heart connections, express yourself with compassion and self-responsibility, listen empathically, and stay centered even in challenging situations. Hridaya France will be hosting a new workshop this spring aimed at accredited yoga teachers and health professionals. The 3-week Yoga Therapy Immersion with Anneke Louise and Ann-Sophie Briest will deepen your knowledge of integrative postural analysis and therapeutic alignment. 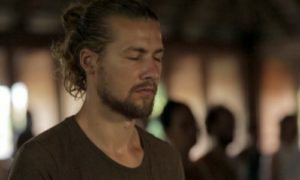 The physical body is a gateway to the deeper layers of the being—this course will add a whole new dimension to your skills. If you’re a 200hr RYT this is the ideal way to advance your knowledge. Join Stuart for a new and exciting workshop focused on the joys of devotion. Have you ever wondered why we worship Ganesha? Or, Lord Rama and his dedicated wife Sita? This offering will bring you the answers and allow you to connect to the fire in your heart. We will build a traditional tantric altar and conclude the event with a puja in honor of Shiva. Don’t miss this opportunity to dive into Bhakti Yoga. “¿Podemos hacer el ejercicio de abrir el corazón otra vez? ¡Me encanta la sensación de tener el corazón abierto!” (Can we do the exercise of opening the heart again? I love the feeling of having my heart open!). 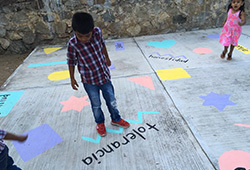 The Educando el Corazón workshops at the secondary school in Mazunte are hitting all the right notes with the local children. Sunny, our Community Liaison, has been teaching them the power of bringing love into a challenging situation and the students absolutely adore it. If you’re not able to visit our main centers in Mexico or France, take a look at our International Events page. 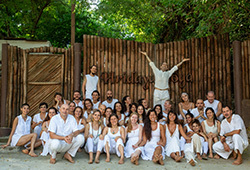 Enthusiastic Hridaya teachers around the world are offering workshops, meditation retreats, and drop-in Hatha Yoga classes. In addition to ongoing opportunities in Mexico, Guatemala, Australia, Austria, and Romania, there are wonderful upcoming special events in South Africa, India, and New Zealand.